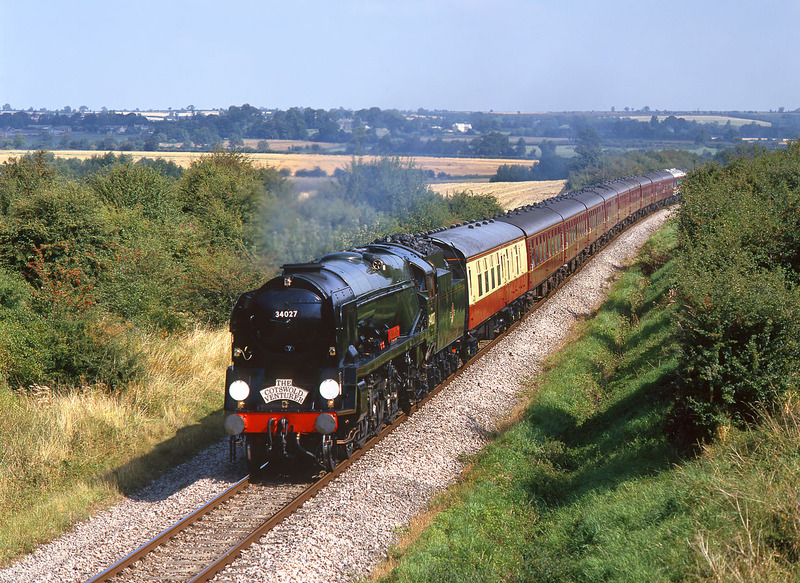 West Country 4-6-2 34027 Taw Valley passes Chilson with the Didcot to Worcester Shrub Hill 'Cotswold Venturer' railtour on 29 August 1993. A warm summer day is hardly conducive to good steam photography, and although Taw Valley is working hard there is virtually no trace of exhaust. Unfortunately this Cotswold Line location is now virtually useless for photography, as the bushes have grown considerably since this picture was taken. This is a pity as it was a very useful location for northbound trains as the line runs south west here for a few miles resulting in ideal lighting during the middle of the day.